1) Poach the chicken thighs in the coconut milk, topping up with water to cover if needed. Once cooked remove from the pan, leave to cool. When cool enough to handle, shred. 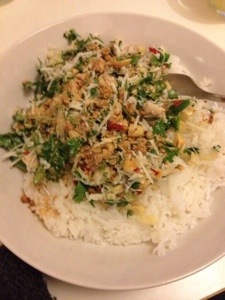 2) Roughly chop the herbs, combine with shallots, lemongrass, coconut etc. 3) Make a dressing from the lime juice, fish, and palm sugar. Adjust to taste. 4) Toast the peanuts in the oven. Chop roughly. 5) Mix everything together and serve with rice, or with coconut rice (extra yummy if you have all that fresh coconut and coconut water to play with!). 6) If you are feeling really fancy top with ancient chilli and coconut relish (toasted coconut, dried chillis, and toasted peanuts with salt – see David Thompson’s Thai Food).